Difference between parrot wing, copper complex, turquoise, chrysocolla, etc. I’m sure this has come up before but though I’ve done some reading, I’m still awfully confused about it. I have a fair amount of various minerals that I think would all fall under the copper complex category but don’t really understand how to differentiate them. Some stones I have were clearly labeled as turquoise with prices to match but much of the rest were bought in bulk by mail or picked up at shows decades ago. When I have a stone, what defines it as chrysocolla? If it is chrysocolla, what defines it as parrot wing; is that just light green mixed with turquoise green and blue? What is it called when it has a lot of white quartz with blue and green staining and other copper matrix? What is it called when it is mostly red or brown but has a line or mix of green in it? When I have something labeled as chrysocolla that really looks and acts like turquoise, what differentiates it? When a azurite is heavy in the mix and green minerals much less prominent is that just called azurite or is that something else? Any information that isn’t wildly technical would be helpful. Thank you! Adding: I believe all my material is from the US or Mexico. Re: Difference between parrot wing, copper complex, turquoise, chrysocolla, etc. First, let's dispose of the easy part: azurite - Cu3(CO3)2(OH)2, chrysocolla - Cu2-xAlx(H2-xSi2O5)(OH)4 · nH2O and turquoise - Cu(Al,Fe3+)6(PO4)4(OH)8 · 4H2O are separate minerals, each with unique chemical composition and crystal structures (though you may need a microscope to see the crystals in rough) and hardness (even though you may find it difficult to determine hardness due to the brittleness/fribability of turquoise). See the entries at Mindat for more about how these minerals differ. Now for the more complicated stuff: when multiple minerals, etc. are mixed together, you get a "rock" and not something that is considered a mineral. "Parrot Wing" is a marketing name for a rock - a mix of the minerals chrysocolla, cuprite, chalcedony, etc. The material marketed under that name generally has a certain look, but it is not a specific mineral or mineral assemblage. Copper secondary materials are such. For instance, chrysocolla can be a colorant in chalcedony quartz (as in Gem Silica), calcite, etc. There are also non-copper containing minerals that have blue-green and other colors similar to copper-bearing minerals, so color is not a reliable factor in determining whether you have turquoise, chrysocolla or something entirely different. If you don't know the location and the materials mined there, it will require testing to determine what you have. What I learned was that the name "parrot wing" chrysocolla is actually a name used for silicated chrysocolla (actually chalcedony stained with copper salts) with a mix of colors resembling a parrot's wing. For example this piece I collected. 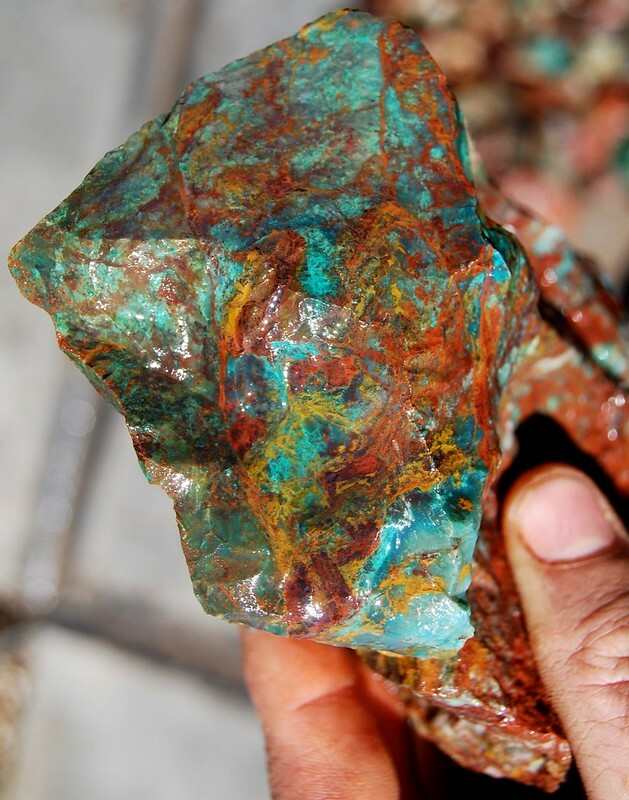 As far a chrysocolla the technical definition is a copper silicate, although the name has become the "catch all" for any unidentified copper ore. I will be sending a sample off for more definitive testing soon. And since turquoise look-a-likes can occur with turquoise even location does not always help. Another thing to keep in mind is that not all turquoise is blue, nor does all turquoise have veining as is commonly believed. Turquoise comes in about 70 shades of color. Here in Nevada a lot of our turquoise is green or has a greenish cast due to the high iron content. And in Persia veins in turquoise is considered a flaw and devalues the turquoise. Thanks. Hmmm.. the brown tones aren't what I think of with parrots, but I guess everyone has seen different parrots! Actually that is dark red.